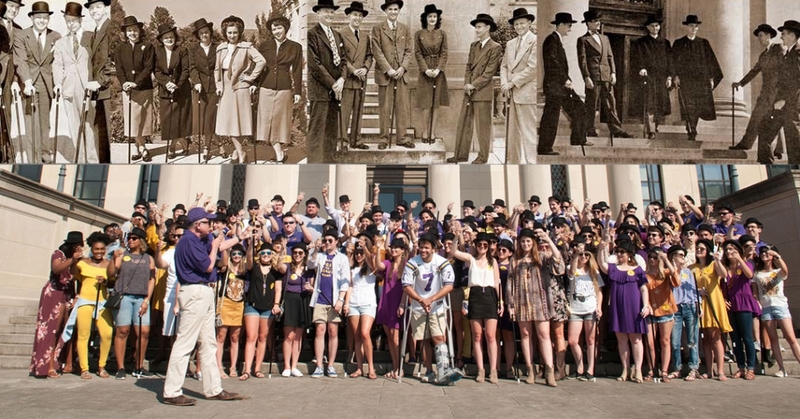 The cane used in the annual LSU Law Hats ‘n Canes ceremony is engraved with the inscription, “From the Pioneering Class of 1908.” The cane was given to Dean Joseph I. Kelly by the LSU Law student body. The Class of 1931 announced that it hoped to lay the foundation for a Law School tradition, which indeed became the case. 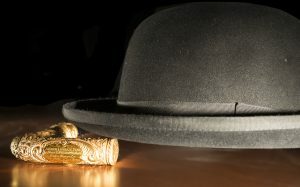 Under the leadership of Ward T. Jones, president of the law students for both the 1931-32 and 1932-33 terms, the seniors decided to wear derby hats and carry canes. The Class of 1935 continued the practice, which Frank Purvis, president of the law students, indicated had been in disuse in America but was an integral part of European law school tradition. A photograph of seniors with the hats and canes continued to be de rigueur in the student newspaper. The Hats ‘n Canes tradition continues to today. From “The Louisiana State University Law School from 1906 to 1977” by W. Lee Hargrave.